Keith McCray stacks another package on the pile waiting to be picked up by UPS The Mailing Center, his store in Shaw's Plaza in Augusta, on Monday. McCray joked that trying to stacked the different-shaped boxes was like a giant puzzle. He said that Monday is usually one of the busiest shipping days of the year, but the snowstorm had cut down on the number of customers coming in. Keith McCray stacks another package on the pile waiting to be picked up by UPS The Mailing Center, his store in Shaw’s Plaza in Augusta, on Monday. 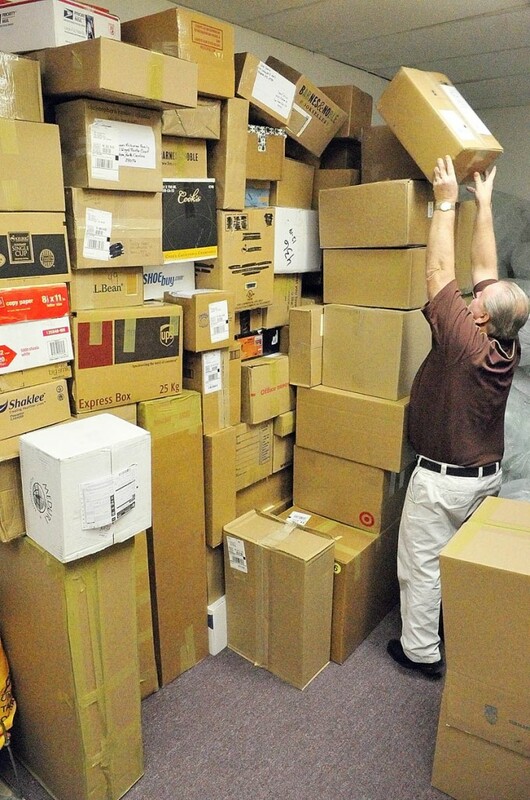 McCray joked that trying to stacked the different-shaped boxes was like a giant puzzle. He said that Monday is usually one of the busiest shipping days of the year, but the snowstorm had cut down on the number of customers coming in.